On Thursday, February 21, 2008, at 06:16:02 AM local time, an earthquake occurred in north-central Nevada. 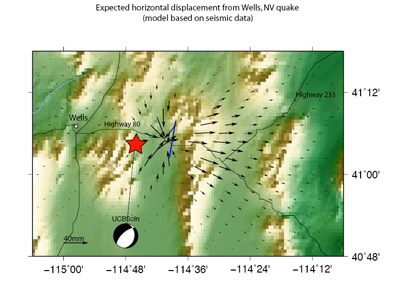 The epicenter was 10 km ENE of Wells, Nevada, near interstate 80. The depth of the rupture was determined at 6.7 km. Numerous buildings in Wells suffered considerable damage (Nevada Seismological Laboratory Press Release Photo Page ). Nobody was seriously injured in the earthquake. GPS: Heavy snowfalls impeded initial assessments of surface traces in the field, but modeling results based on the seismic data (Hammond and Kreemer, University of Nevada Reno) produced expected horizontal displacement magnitudes of up to 1 mm detectable at several permanent GPS stations in the EarthScope PBO network (stations RUBY, GOSH, ELKO [part of the BARGEN network funded by DOE; Wernicke et al. 2000], P007, P114 are all about 60 km from the epicenter). High-rate (5 Hz) GPS data from these stations as well as 2 reference stations for February 20-22 have been retrieved by PBO and are available at PBO Web (Dates with links listed in upper left corner of page). Requests for additional PBO data sets should be submitted here. Standard daily (15sec sampling) files from the PBO Nucleus, PBO, and Caltech stations are available from the UNAVCO Data Archive Interface. UNAVCO has Facility and EarthScope Campaign GPS systems readied for rapid deployment to measure post-seismic deformation on request, with field engineering support available as well. Please contact Event Response Coordinator Freddy Blume (blume unavco.org) for assistance and submit a formal request for support at UNAVCO Support. 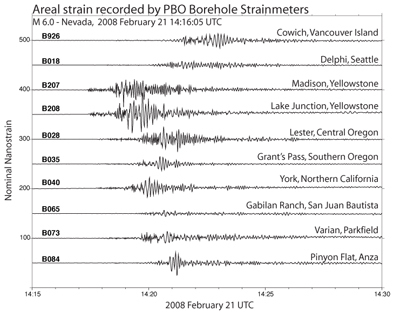 Strainmeter and Seismic data from PBO: PBO strainmeters/seismometers in Yellowstone, Oregon, and California recorded the event. Strainmeter data for this event can be found here. InSAR data: UNAVCO has been in contact with members of the InSAR community and mission managers at the European Space Agency (ESA) to help ensure the acquisition of InSAR data for the region. The ESA ENVISAT satellite's next pass over the area should take place on Feb 27 (unfortunately, subsequent ENVISAT acquisitions may be difficult due to data relay issues beginning in March). The ESA ERS2 satellite is also planned to acquire data. Both ENVISAT and ERS2 were programmed to acquire data for this region as part of EarthScope. ESA confirmed the acquisition planning in the face of this event, and has agreed to help make the data available to the community as quickly as possible. In addition to ESA, efforts are under way by WInSAR members to acquire data from the Canadian Radarsat-1 and Japanese ALOS SAR missions (contact David Phillips dap unavco.org for more information and data access). Ren�e Duffy of the Nevada Department of Transportation office in Ruby Valley, about 60 km from the earthquake epicenter described her experience of the earthquake in a phone conversation with Ellie Boyce of UNAVCO: "I was sitting in my office on the phone yesterday morning when the earthquake occurred. First the power cut out, then came back on flickering, but the phone lines didn't cut out. Then I heard what I thought was a gust of wind, but realized later was the rumbling from the earthquake. The concrete floor in the maintenance garage felt like someone had picked up the building and started shaking it. The building and windows shook and rattled but nothing fell or was broken." UNAVCO is funded by NSF and NASA. Reference: Wernicke, Brian., Friedrich, A. M, Niemi, N. A, Bennett, R. A., and Davis, J. L., 2000, Dynamics of plate boundary fault systems from Basin and Range Geodetic Network (BARGEN) and geologic data: GSA Today, v. 10, p. 1-7. 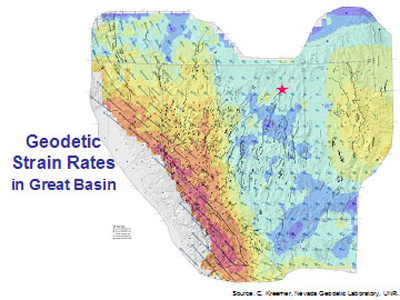 Figure 3 - Map of contours of the rate of strain accumulation in the Great Basin. The redder the colors the more rapidly the crust is accumulating strain. This strain is generally released in future earthquakes. The map is produced by interpolation of horizontal motions measured at hundreds of points using GPS. The Wells earthquake (star) happened in an area where the GPS measurements indicate as little strain accumulation as within the stable continent. Figure 4 - PBO borehole strainmeter data recorded around the time of the Wells earthquake.